mini ministry: believe because you know Him :: sharing the Way, Truth and Life in Jesus Christ: Christmas letter 2010: what Joy is this? Christmas letter 2010: what Joy is this? 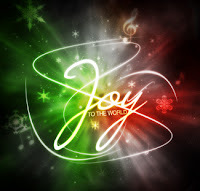 Joy is a word often seen and heard during the Christmas season, and it's a topic I can't seem to get away from anymore. Yet if you've had years like my last few, suffering some significant pain and loss in this world (and I know many who have and are), you might understand it's not something I want to get away from. But the joy of which I speak isn't found in the things of this world, and therefore can't be destroyed by the loss of them, or even increased by worldly gain. Grief and gratitude are both appropriate reactions in certain situations, but true joy is measured well beyond emotion and circumstance. It is joy that comes from and is found in God alone. There is a significant gift I received this year in which I take great joy. By God's grace, I haven't missed a day in His Word since January 1. And one of the many threads this allowed me to see repeatedly in the Bible is that of joy in the Lord. In the English Standard Version the word "joy" is translated not quite 200 times, with even more instances of the word "rejoice," and countless other expressions of joy throughout. All this joy from men and angels over one child—an amazing child who would grow into a Man, live as no man had, without breaking God's Law, and come back to life after a horrific public execution, all to fulfill the promise of God to save His rebellious people in their broken world. Joy is a gift of Jesus to those who, by His grace, stop living out of that brokenness and instead trust Him. To know this Man, then, is to know a joy we can't find within ourselves or in anything around us. To be known by Him is unspeakable joy. On this note, I want to share something from a man God has used to help me grasp this concept as the Lord took His joy beyond mere talk or intellect and continues to form it deep in my heart. Pastor John Piper's "Quest for Joy" draws out six Biblical truths on where true happiness and joy come from as found only in Jesus. Even if you happen to be familiar with this writing, I encourage you to dwell on this truth, asking God to use it to change you in ways yet unimaginable. "Quest for Joy" by John Piper. ©Desiring God. Website: desiringGod.org. Graphic used by Creative Commons license from creativemyk.com.